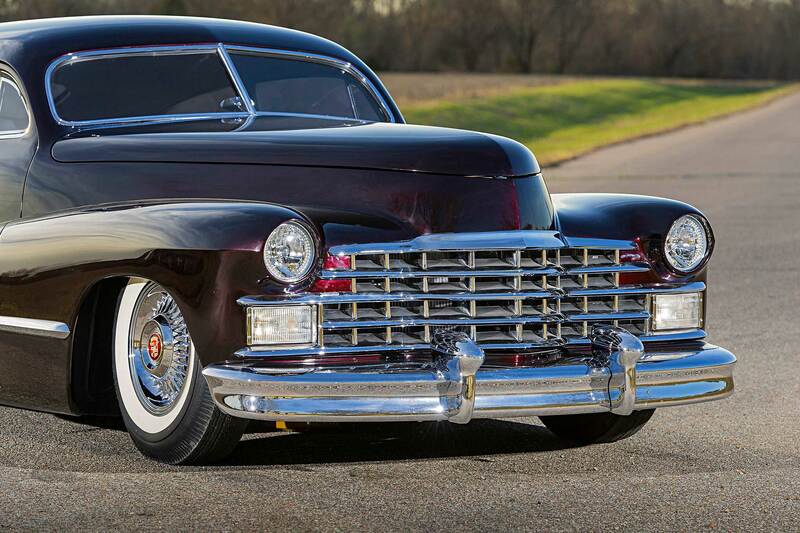 Not surprisingly, Cadillacs have been popular raw material for some of the greatest custom cars. 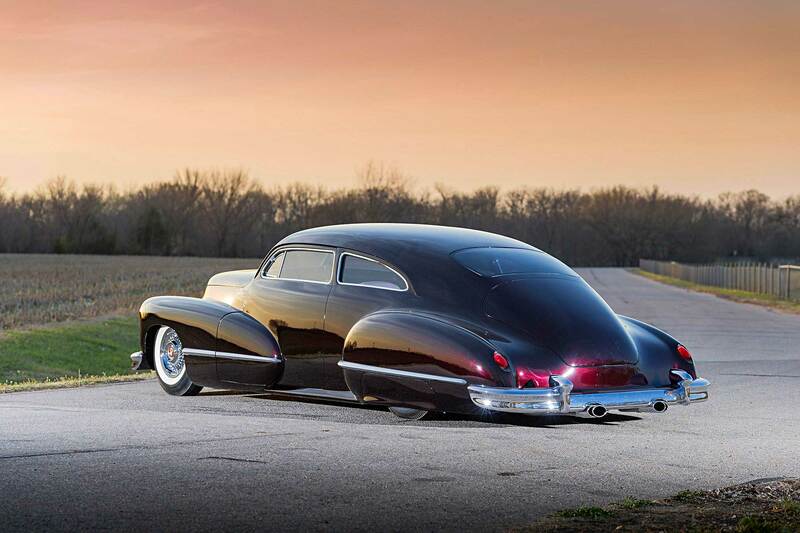 Every iconic customizer, from Harry Westergard to Chip Foose, has taken their turn at building them. 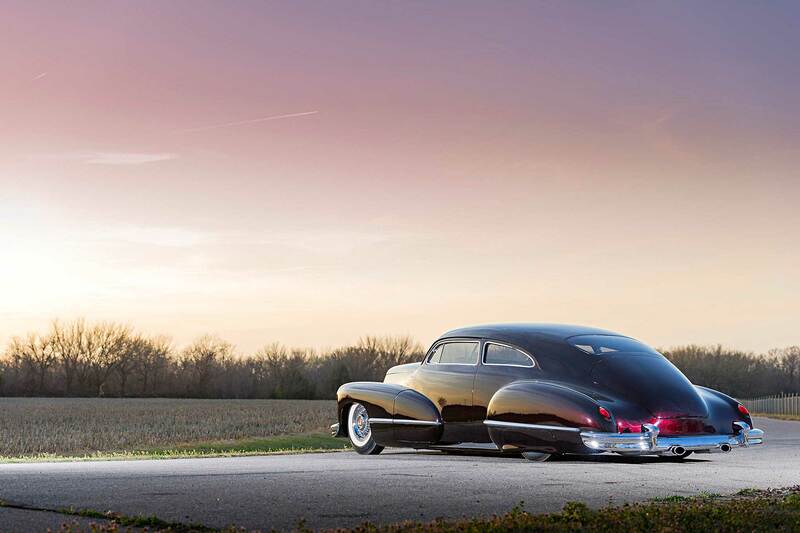 One of our recent favorites was the 1949 Sedanette built by Chris Carlson Hot Rods (CCHR) in Mulvane, Kansas. 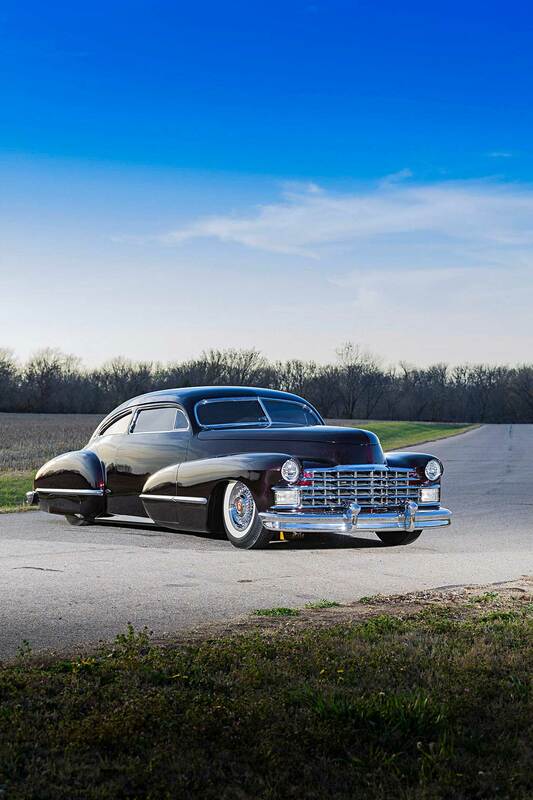 As it turns out, that custom was inspired, at least partially, by a stunning 1947 Cadillac that was nearing completion at CCHR. 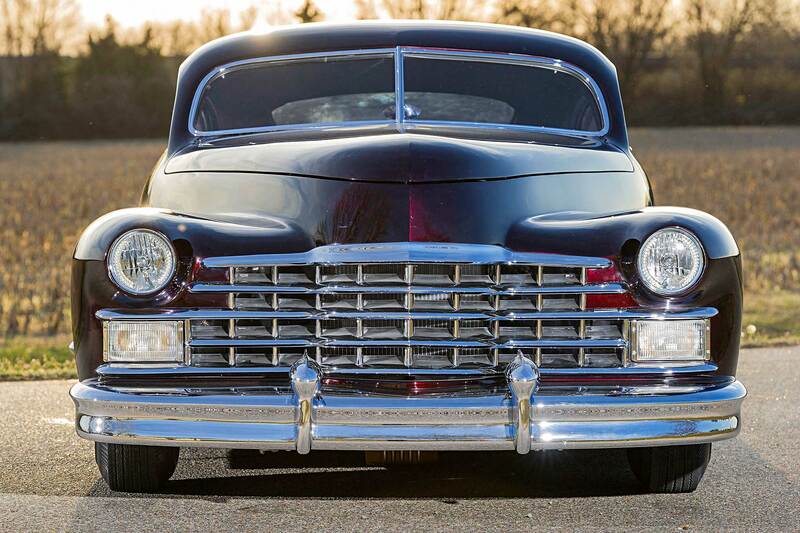 This is the story of that 1947 Cadillac. Once the Sedanette had changed hands, it was shipped north to Mulvane, where Carlson and his builders continued the transformation. 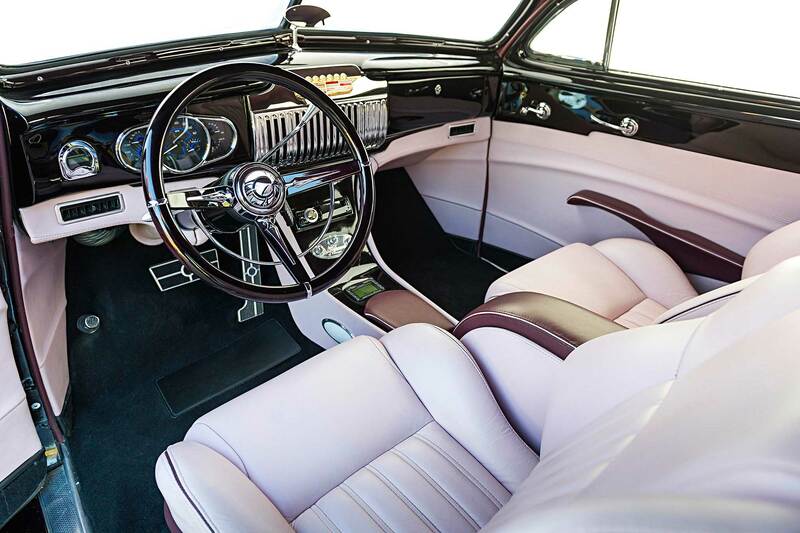 The 3-inch top chop performed by DeRosa enhanced the long, low Deco look that everyone loves. The chop required new glass, provided by Bair’s Glass Company in Winfield, Kansas. 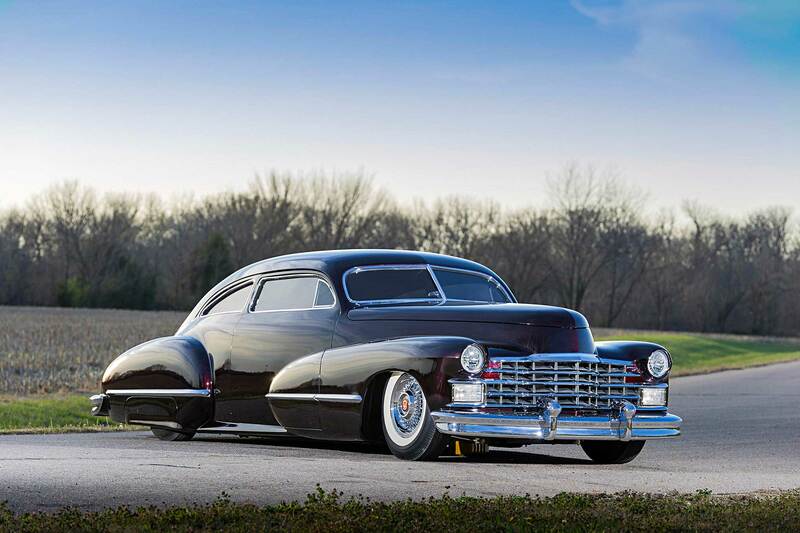 The rear window was replaced with flush-mounted 1949 Caddy glass. 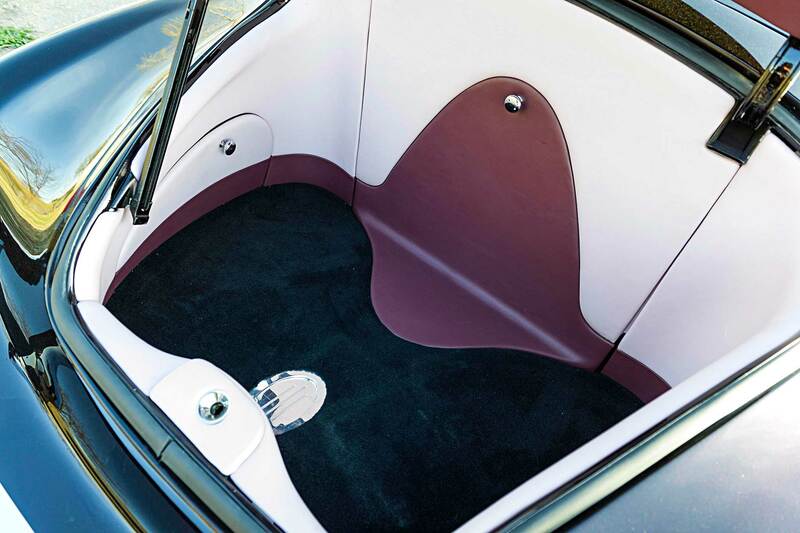 The modified fender trim was left intact, but the rest of the body ornamentation, plus handles and locks, was shaved. 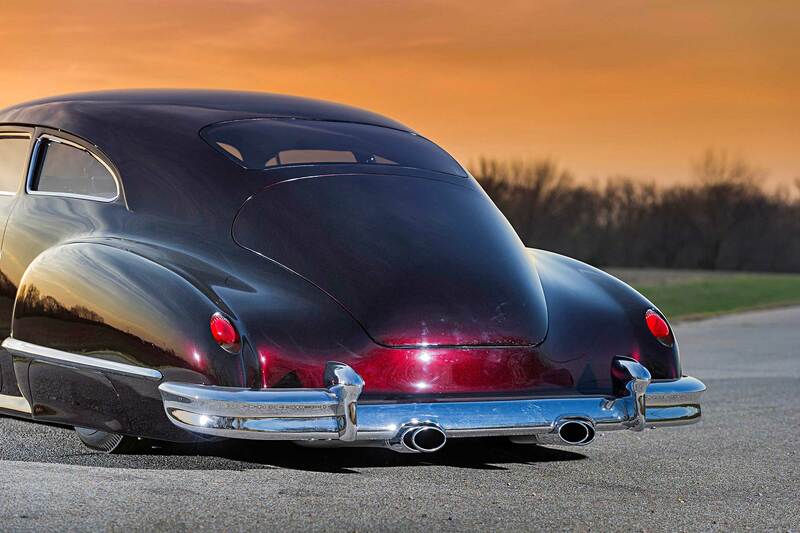 The rear fenders were molded into the body and flared at the bottom; the flare continues into the reshaped rockers. The stock grille was mildly reshaped, and front and rear bumpers were pulled in and flush mounted. 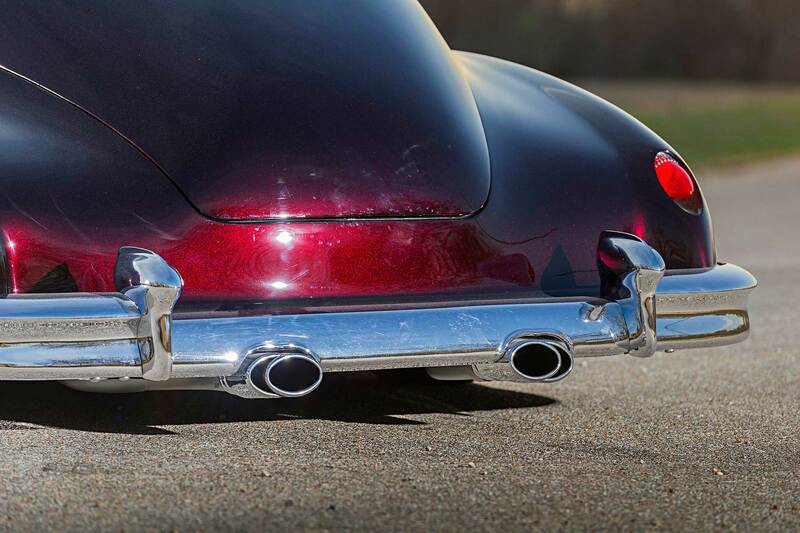 The headlights were frenched; the frenched taillights are the distinctive bullets from a 1959. Take a close look at the pancaked hood. The CCHR fabricators filled the seams to mold the hood into the fenders and recut the steel to create a smaller, sports car-style hood. Eventually, when the Sedanette was ready for paint, Carlson used Martin Senour paint to custom mix the color Buddy wanted. The finish can look black in certain settings, but when the light hits it, the black cherry candy reveals itself. 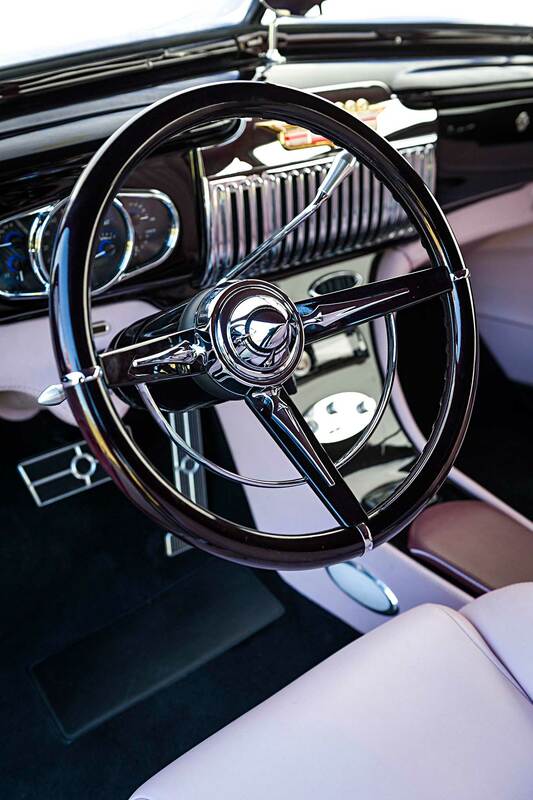 The extraordinary paint is complemented by the flawless chrome done at Sherm’s Custom Plating. Long, low lines are most effective when matched with a street-scrubbing stance. 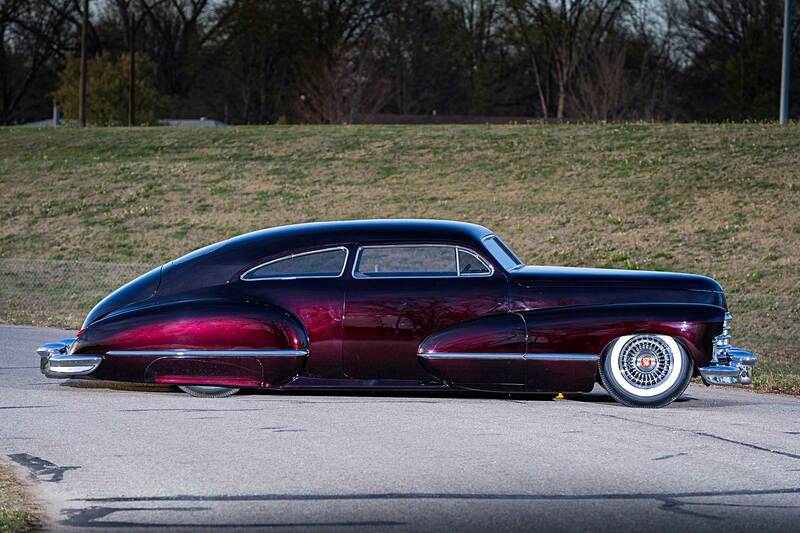 CCHR used the Cadillac’s factory ‘rails as the starting point for the chassis, boxing them for strength. 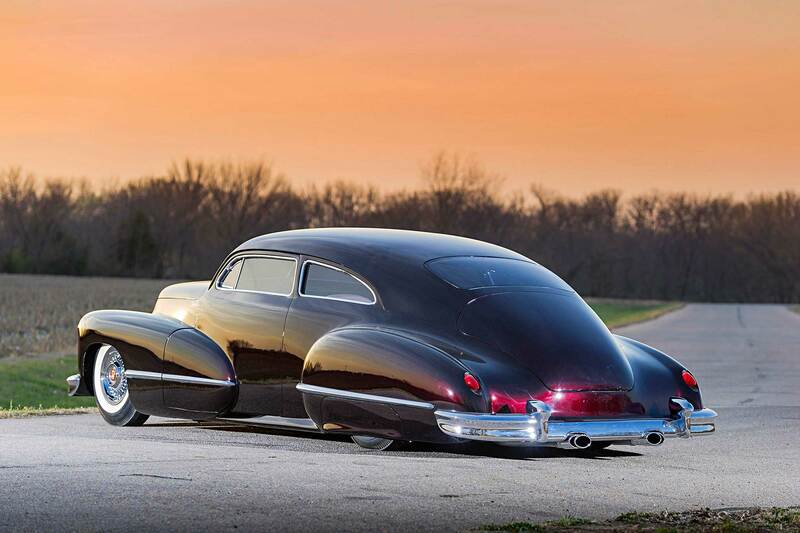 RideTech air suspension at all four points help drop the car to the pavement. Total Cost Involved provided the Mustang II-style independent front suspension, including 2-inch dropped spindles. The rearend setup features a TCI four-link suspending a Currie 9-inch rear with 3.73:1 gears and a Truetrac differential. Wilwood discs, master cylinder, and pedal assembly ensure dependable stopping power. 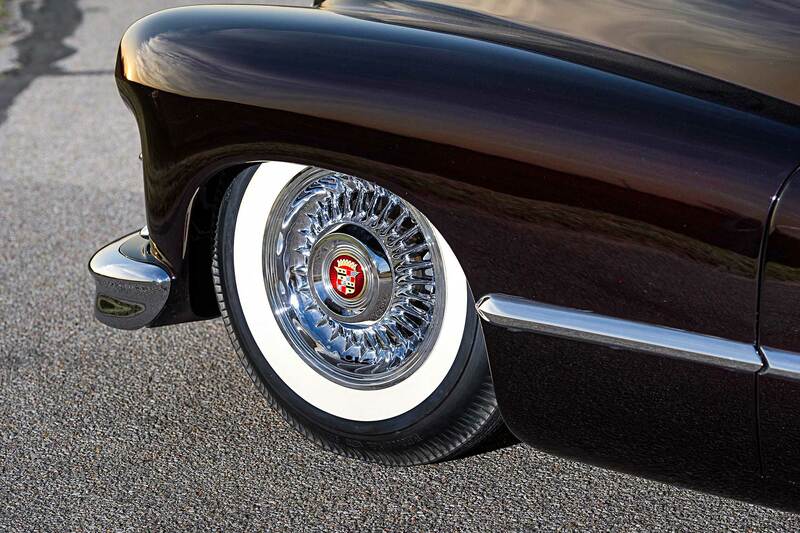 In the rolling stock department, it doesn’t get more authentic than whitewall piecrust rubber on Cadillac wheels. 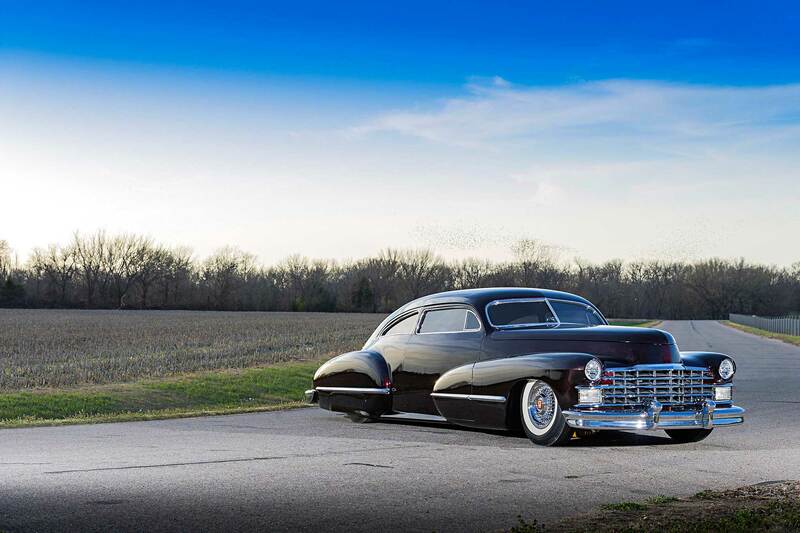 Buddy’s 1947 rolls on 15×7 1955 Cadillac Eldorado wheels rebuilt at CCHR and chromed. The period tires are 7.50-15 BFGoodrich Silvertown bis-plies from Coker Tire. 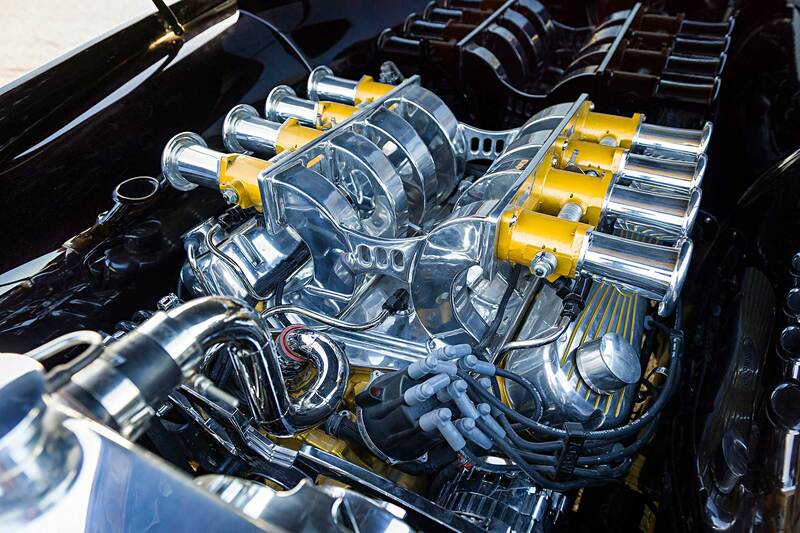 The Cadillac identity continues under the hood in the form of a 1976 500ci engine, but not the way you may remember them. 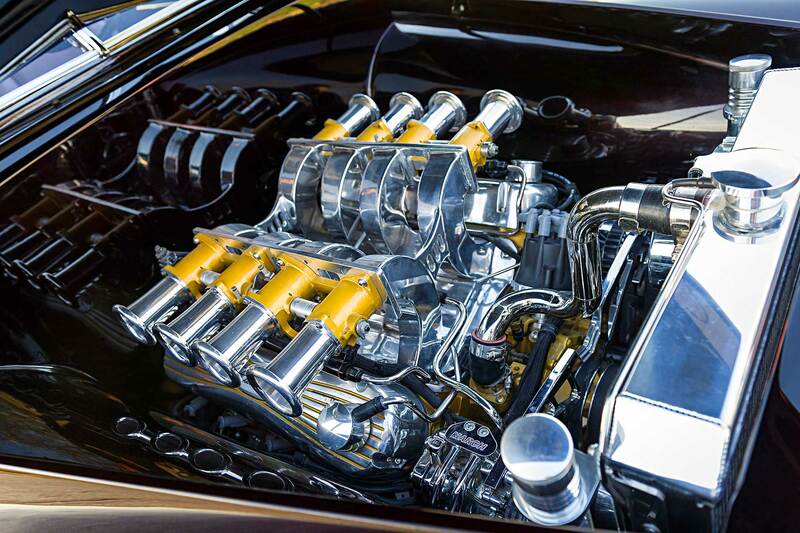 Not only has this version of the engine been extensively plated and polished, it’s extensively modified. 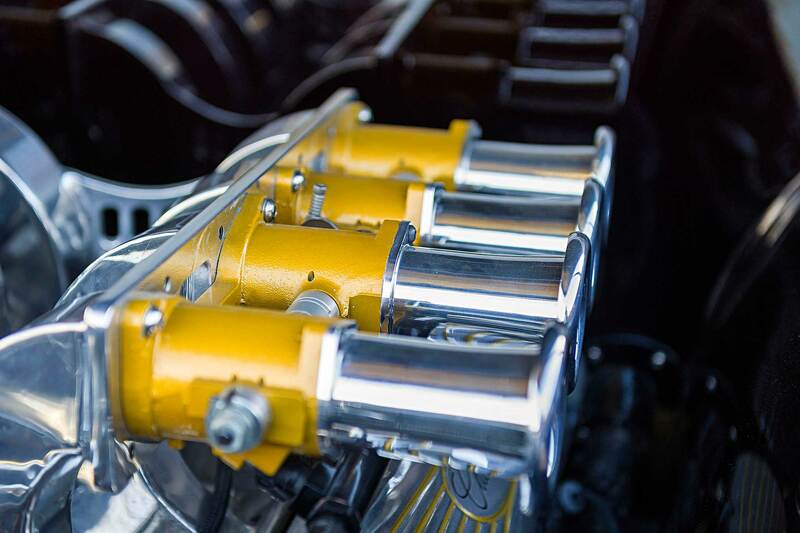 Carlson and the CCHR builders created a custom cross-ram manifold and side-draft stacks to feed the FAST electronically injected engine, fired by an MSD ignition. 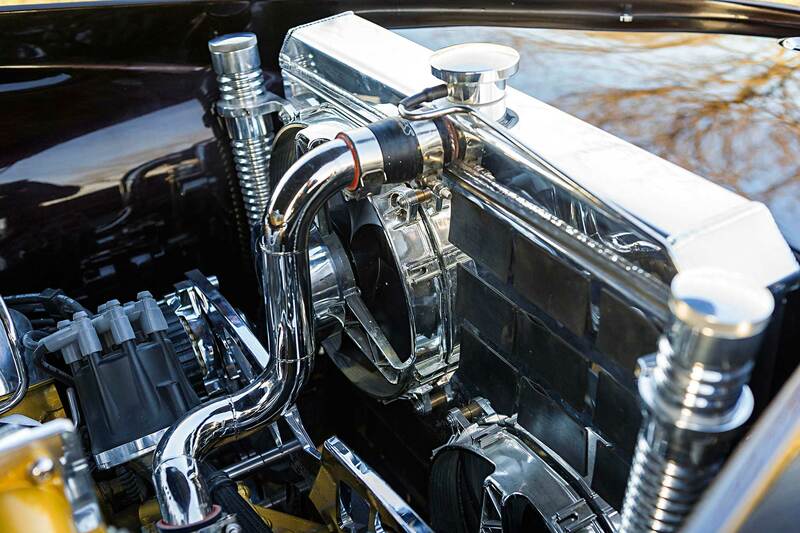 Custom headers pull the gases to a custom stainless exhaust system with MagnaFlow mufflers. The Be Cool radiator is paired with a Spal fan. 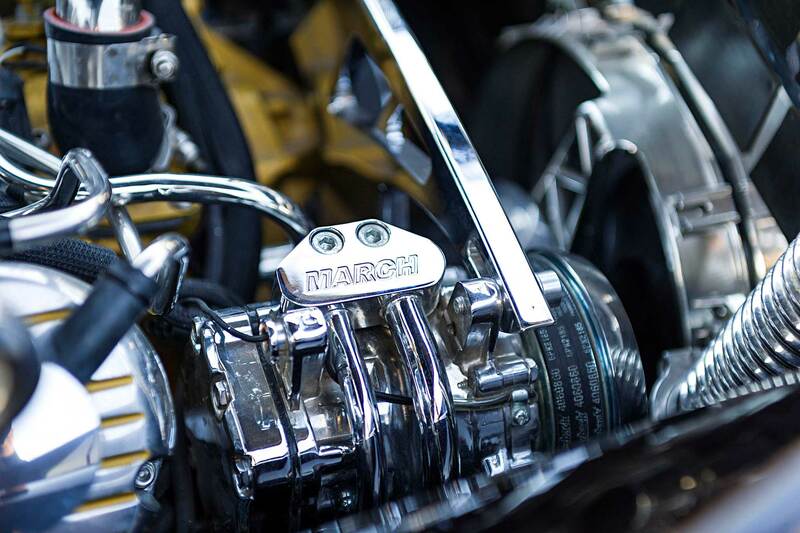 An Edelbrock water pump is driven by a March Performance pulley system. The 700-R4 was built by Chance Transmissions in Wichita. 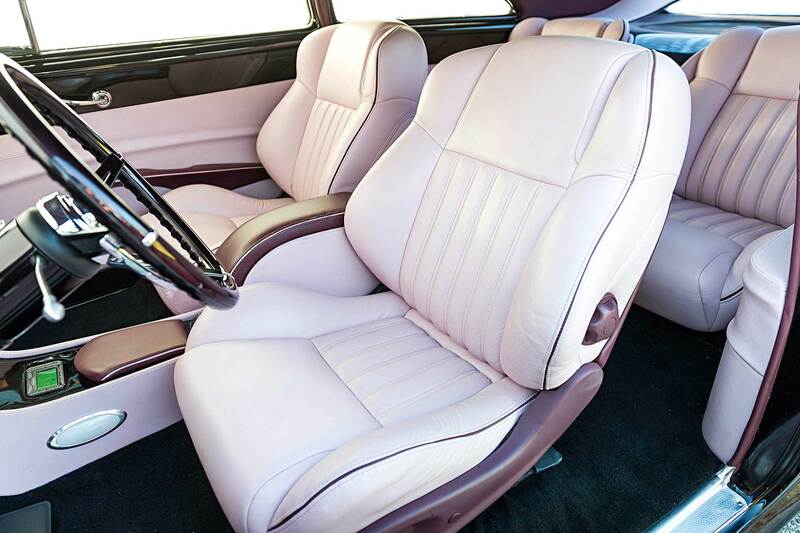 For interior attention, the car went to Hemet, California, where Wanda’s Auto Upholstery finished the inside. Jordan told us that Wanda Wells said to trust him. He did, and the results are fantastic. 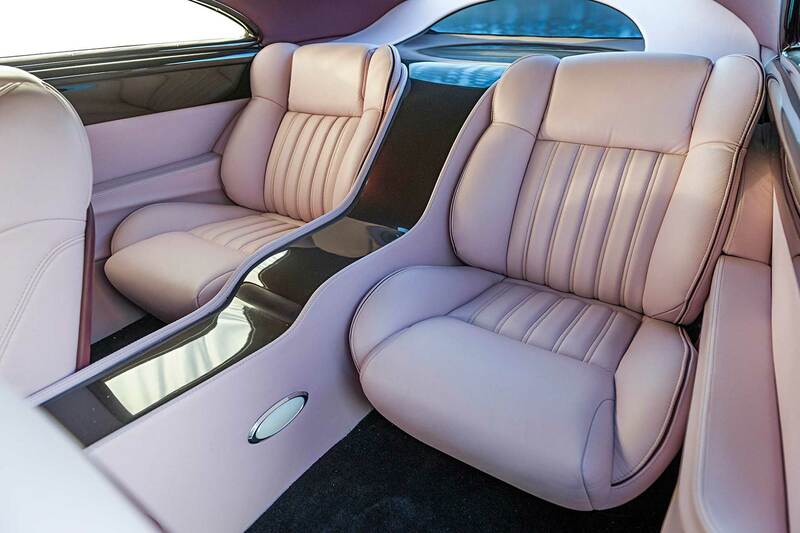 Beautiful salmon and merlot two-tone leather covers late-model GTO seats, as well as the custom-built door panels. 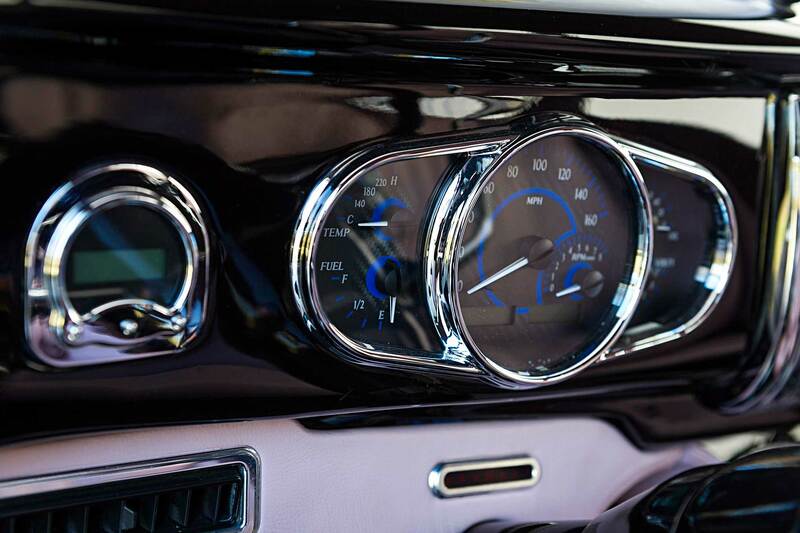 From the driver seat, Buddy can keep his eyes on the Dakota Digital gauges and his hands on the CON2R steering wheel mounted on an ididit tilt column. 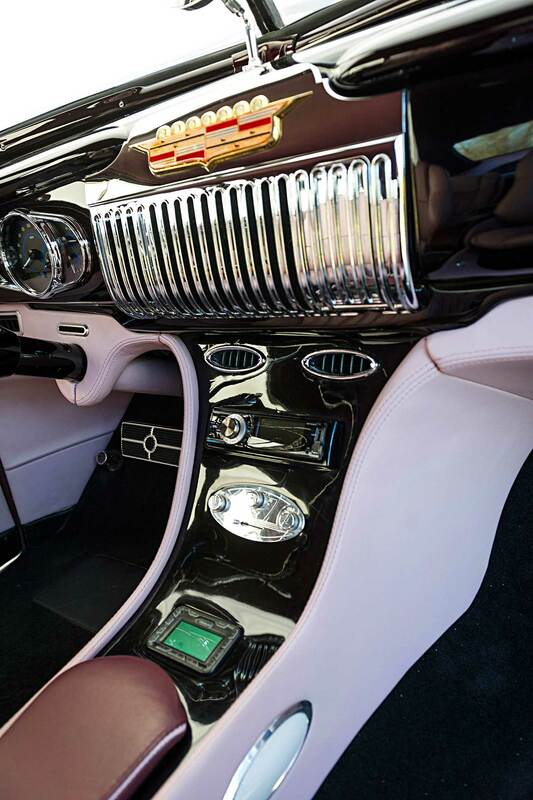 Controls for the Vintage Air system and the audio system are at his fingertips, mounted in the fabricated console just below the original speaker grille. 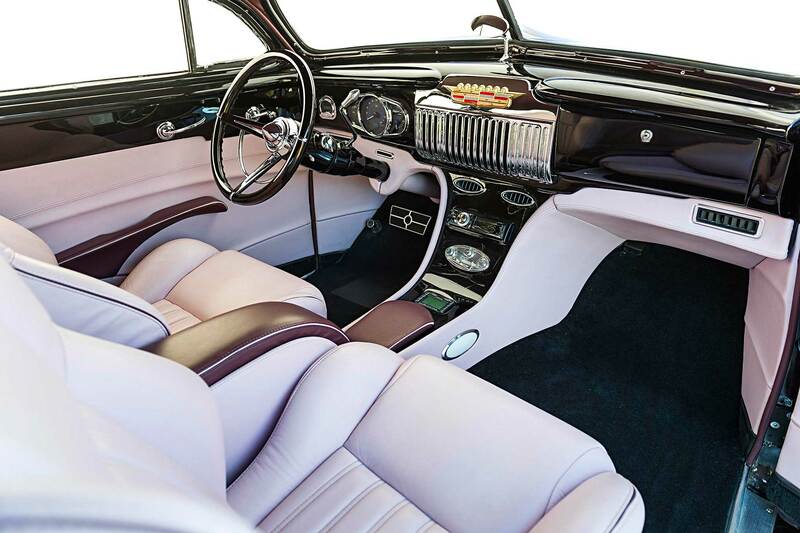 When the 67th annual Grand National Roadster Show came to the Pomona Fairplex, the 1947 Sedanette was ready. Buddy Jordan and Chris Carlson left the event with the First Place Award for the Cadillac’s class. Meanwhile, work was underway on Buddy’s 1933 Ford roadster that would earn the Ridler Award a year later. 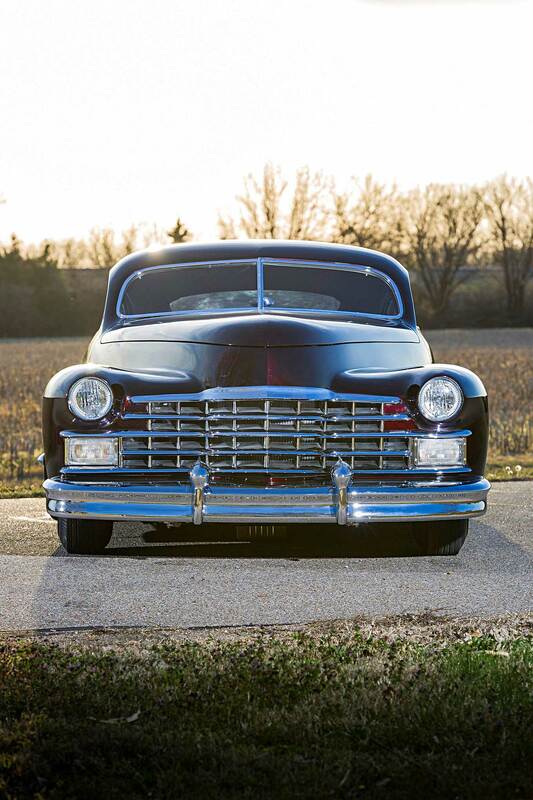 And as you are reading this, there is a 1941 Cadillac custom coming together at CCHR in Mulvane—another collaboration between Buddy and Carlson. We predict another award winner. How about you?